From Peter Tchaikovsky’s “First Piano Concerto” to composer-in-residence John Mackey’s “Redline Tango,” Bravo! will offer celebrated works of the masters. The Rochester Philharmonic Orchestra, the Dallas Symphony Orchestra and America’s flagship orchestra – the New York Philharmonic – will perform programs during their residencies. And, chamber musicians will fill the Vail Valley with an abundance of exceptional performances. “Bravo! reached a milestone in 2003 with record-breaking crowds,” said Bravo! Director of Marketing and Public Relations Liana Carlson. She said 2004 is shaping up to bring even more excitement to the valley with many new soloists and the return of the Rochester Philharmonic, the Dallas Symphony and another chance to see the New York Philharmonic. Under the baton of music director Christopher Seaman, the Rochester Philharmonic Orchestra kicks off its 14th year at the festival on June 27 with a Tchaikovsky program, featuring pianist Olga Kern. Kern is the first woman in 30 years to have taken home the gold medal in the esteemed Van Cliburn Piano Competition. The Dallas Symphony Orchestra, led by music director Andrew Litton, returns to Vail July 9, and opens with Andre Watts – one of today’s most distinguished pianists. This program combines the old with the new, including works by Felix Mendelssohn, Francis Poulenc, Maurice Ravel and Mackey. Violinist James Ehnes returns to the festival the following evening for a performance of Beethoven’s “Concerto” with the Dallas Symphony led by maestro Litton. The evening also includes works by Ludwig van Beethoven and Sergei Prokofiev. The Dallas Symphony closes its residency on July 17 with Beethoven’s “Ninth Symphony” and the “Choral Fantasy,” joined by pianist Adam Neiman and the entire Colorado Symphony Orchestra Chorus – a performance not to be missed. Bravo!’s great resident-orchestra triumvirate will be complete when the New York Philharmonic returns for its second residency in the valley. Bravo! will celebrate the New York Philharmonic’s opening night with the 17th annual Gala Dinner, Dance and Auction, immediately following the concert. Maestro Charles Dutoit will join the New York Philharmonic for their final two concerts on July 29 and 30. Dutoit’s programs will include Beethoven’s “First Piano Concerto” with Jonathan Biss, Schuman’s “Cello Concerto” with Daniel Müller-Schott, as well as works by Ravel, Prokofiev and Igor Stravinsky. 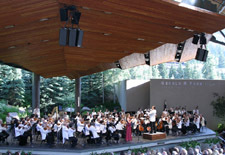 Patrons of classical music can reserve seats in the covered seating section or relax on the lawn with friends, family, a picnic basket and wine at the Ford Amphitheater. Performances will also be held at the Vilar Center for the Arts in Beaver Creek and other festival venues throughout the valley.